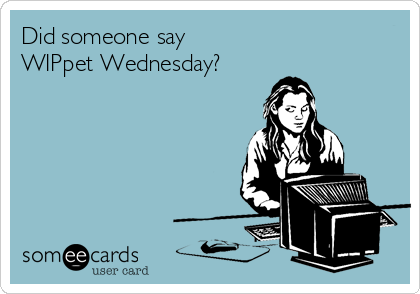 Oh, here we are, yet again, a WIPPet Wednesday… wow! How did that sneak up on me so fast? I was planning originally to return to Courting the Swan’s Song for these posts, but well… after fighting with several transition scenes in CTSS that I had set a goal to finish by August (not gonna happen, nope, no way), I just want to spend sometime doing something fun. And playing in the sandbox is pretty darned fun, IM(not-so)HO. So here is yet another piece from my Was Long Variation fanfiction. For the maths, I have 7 for the month of July; I’m subtracting the 2 twos from the day. Then I am multiplying the remainder by 2 and then 0, getting an answer of zero. And then I figured since a zero word entry would make crappy reading, that I should use the 1 and 5 of 15 to make six. She removed her hand, but a fire coursed through him until the line where her fingertips had touched felt etched in his very bones. “Silav?” he asked, needing to redirect his attention from her touch. For those who are curious, this scene comes just a few short paragraphs after a scene called The Arc of His Own I posted for the Weekend Writing Warriors bloghop in June. It’s a short piece (for the WeWriWa, snippets can’t be any longer than 10 sentences, preferably closer to eight), but a lot of people seemed to enjoy it. He nodded. Even if it was a tease, which he doubted, he owed her. He leaned down, lifted her chin with a fingertip. Drawing her close, he reached an arm around. He pressed her body into the arc of his own; he nipped at her lips–not once, not even a few times—he kissed her lips, her jaw, her neck… His fingers caressed the line of her clavicle and breast. A thrill ran through him, warming his senses, sparking images and unremembered thoughts. She threaded her own fingertips through his hair, clutching. She nipped at his earlobes. Just as he was about to ask if she didn’t mind more, she retreated, swallowing frantically. Thank you for reading; I hope you enjoyed the snippet. Coming up for WIPpet Wednesday, please enjoy another sample from the Was Long Variation. For the month of June, I have switched all my bloghop snippets to this work as I dive full-steam in the ♥Just Write♥ madness that are JuNoWriMo and Ready. Set WRITE! challenges. * for those of you who would like to read a (non-fanfiction, but more futuristic) story I posted as a serial back in 2012, please check out the Unnamed Story links on the Stories From My Worlds page. The snippets aren’t short, so plan some reading time.